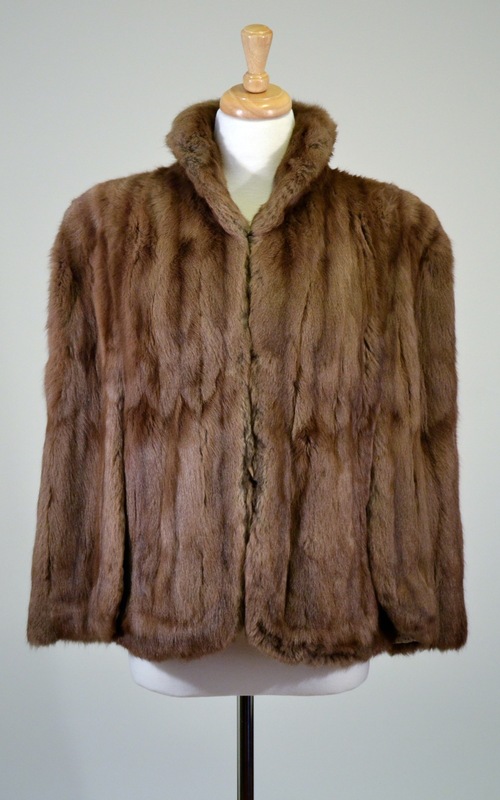 Please scroll down to see The Mildred Mink Cape modeled and in greater detail. Inspired by: Mildred Pierce (1945). Closures: Three thread covered metal hook-and-eye closures up the front of the cap. Label: Benioff's of Allentown - Reading. The arm slits measure 14" on each side of the cape. There is a very minor 1/4" mark (it looks like pen perhaps) on the inside lining, right panel. This, of course, is not visible when the cape is worn. The hem near the collar is somewhat looser than the rest of the hem. This could be easily fixed if you'd like to sew into the base of the fur and can be seen in one of the images below. Loose seam at the back of the collar. Not visible when worn. Monogram embroidery, inner left pocket. A clue to this lovely cape's early life . . .
Label, sewn into the collar. PA love!